Hello and welcome back to another update of Forgotten Hope. What today's update lacks in quantity we hope it makes up for in quality, because today we are showing the new British soldier model for Normandy. This new player model was made by Remdul, based on the Africa player models made by Rad. 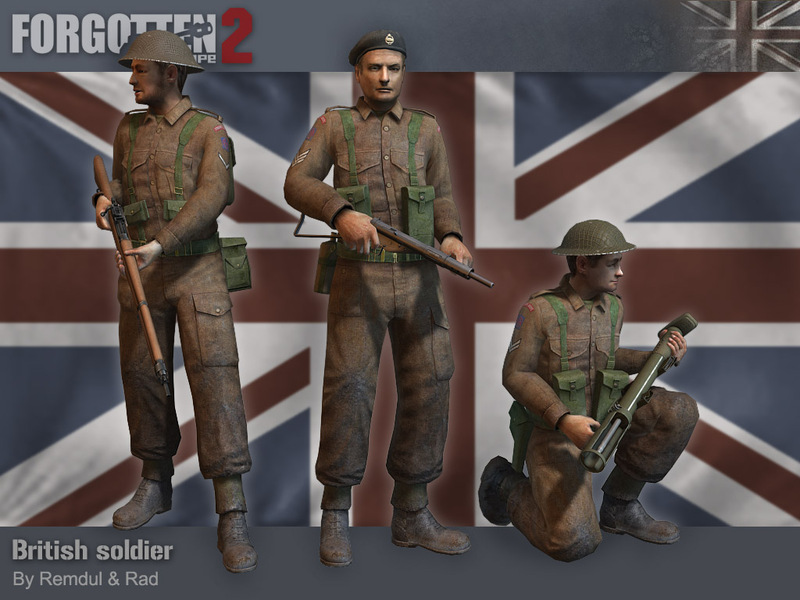 As you can see on the render, the British soldier not only has a brand new uniform for combat in Normandy, but also more pouches, equipment and headgear. This means that you will see more variety between classes. We also hope to bring these extra pieces of equipment back to Africa in our next release. The next item we have for the news today isn't just for digging holes - it can also be a very useful weapon in hand-to-hand combat. 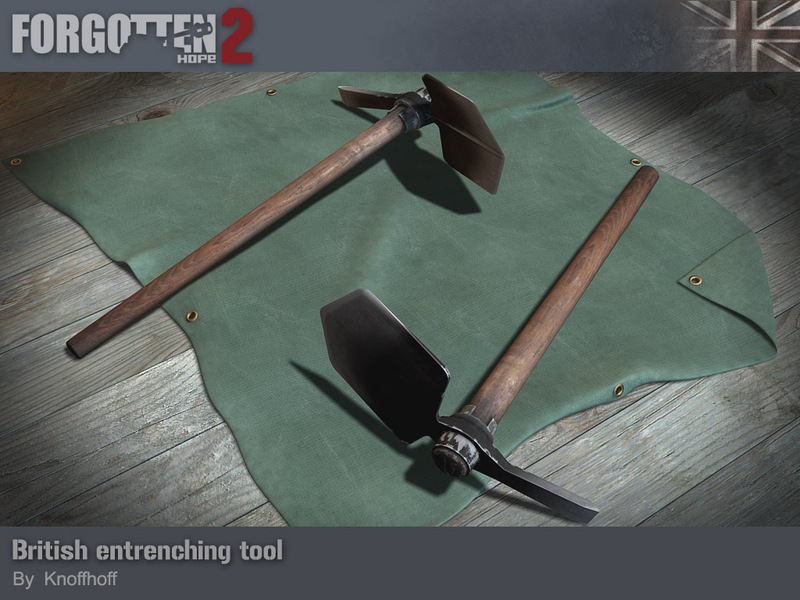 This British entrenchment tool was made by Knoffhoff. Finally, we have an advertisement from the World At War Tournament. Do you want to play Forgotten Hope 2 with an organized team? Tired of the same old random battles on public servers? Seen enough teamkilling smacktards for a lifetime? Had enough of the old desert sands and yearn for something greener and less flat? Do you want to be part of a thriving community of diverse gamers that includes players from around the world: from the United States to Great Britain, from Germany to Finland, from Brazil to Australia. Look no further than World at War. The World at War Tournament has been producing the best team play on the Battlefield platform for over six years and is proud to welcome you to our 18th campaign. A lot of experience has been gained using FH2 and many new, exciting and challenging maps and custom equipment has been provided by our map and mod teams. In the newest installment of the World at War tournament, his Majesty's 56th "Black Cat" London Infantry Division fighting for King and Country takes on the German Kriegsmarine's land forces, the 55th Marine �Infanterie� Division "Gotenhafen". Both divisions are led by experienced WaW players that have proven themselves over many campaigns as great teamplayers and leaders that strive to command their side to the ultimate victory. Together with your officers, you will develop true camaraderie as part of a friendly and helpful community without the obligations of a clan. Will you be taking Europe by storm as an Infantryman of the Kriegsmarine's "Gotenhafen" or will you drive the Axis back fighting for the "Black Cats" under the banner of the British Empire? What can the World at War Tournament offer you? Massive 11-hour 64-player engagements every Saturday. Fight when you can, for as long as you can. Organized engagements enable you to play the game the way it was meant to be played. A complete gaming experience. Relive World War II as if you were there. Start as an enlisted soldier and work your way up the historical rank structures to fight and lead as an NCO or even an officer. Work as part of a unit complete with a chain of command. Earn badges and authentic medals and make your mark on WaW history. Intuitive strategies and battle preparations make the World at War tournament a unique experience. Fight as part of the entire war effort by capturing and defending territories deciding the final campaign outcome. Follow the progress of the conflict using the new and improved battle map which includes over 30 territories and maps to conquer as well as new strategic elements. Each battle plays a vital part to your team's ultimate victory, right down to the very last round. Coordinate with your company brothers in arms on the battlefield using TeamSpeak 2 technology. A microphone is recommended but not mandatory. You will feel the tension as you coordinate the assault with air, land and artillery assets or as you prepare for the enemy counter-attack. Fight on beautiful custom maps from Tilly Sur Seulles in France, Sicily, Rat Race in Egypt, Lebanon, to Iskenderun in Turkey. Our dedicated map team ensures the maps provide a fun and varied experience and are balanced for tournament play. Use new custom equipment created by the WaW mod team such as the Crusader 2 CS Infantry Close Support tank. Beautiful new static objects such as Italian mansions and a fully functional American Pontoon bridge with many more to come. Best of all: WaW is completely free! Join up today and leave the plain old days of the public servers behind you. CLICK HERE TO JOIN THE WAR!